Making it possible and affordable for anyone to make a statement with beautiful artwork, Stampa showcases limited-edition prints by a roster of top illustrators, artists, and designers. The prints are made digitally, with archival inks and substrates; prices range from $100 for an unframed 8-by-10-inch print to $800 for an 18-by-24-inch framed print. For Father’s Day, Stampa is offering an exclusive print collection that puts a twist�or should we say a stitch�on the traditional Father�s Day gift. 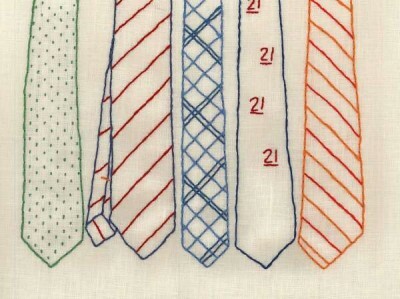 Renowned for his playful, colorful artwork that is hand stitched or drawn, Stephen Campbell created prints of iconic Father’s Day items, including Old Spice, ties, and a #1 Dad coffee mug. Coverage so far has included Cool Hunting, HGTV, TrendHunter, and Jordan Reid of Ramshackle Glam, who the New York Observer hailed as a new generation Martha Stewart.